I’m renaming this week the unofficial Felt DIY Week! I have three really fun felt projects to share and they all are so quick, you can make them in under an hour. 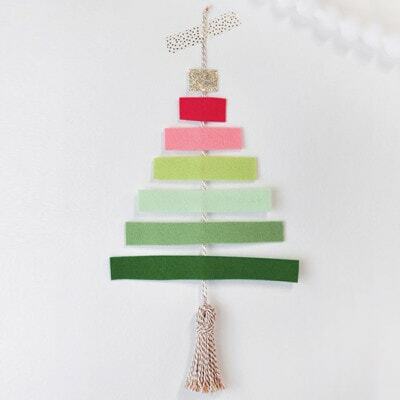 Today I’m staring off the week with brightly colored DIY Felt Ornaments… and now I want to make a million of them!! 1. My felt came in a 5″ roll, so I measured and cut out a 5″x5″ square. 2. 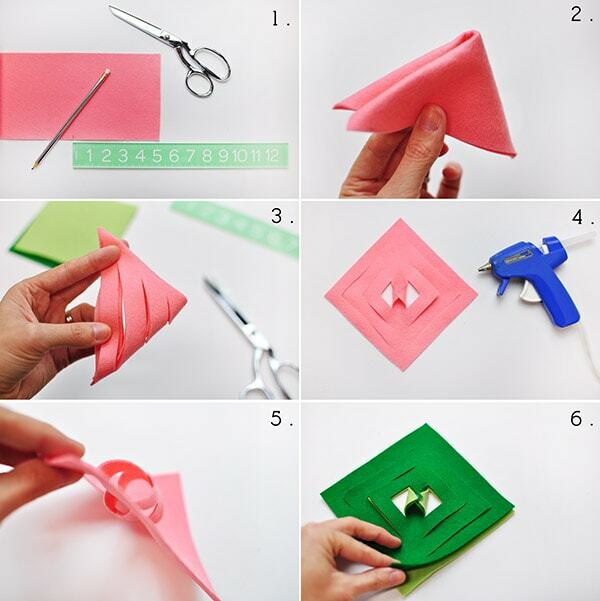 Fold your square into a triangle and then fold it once more. 3. 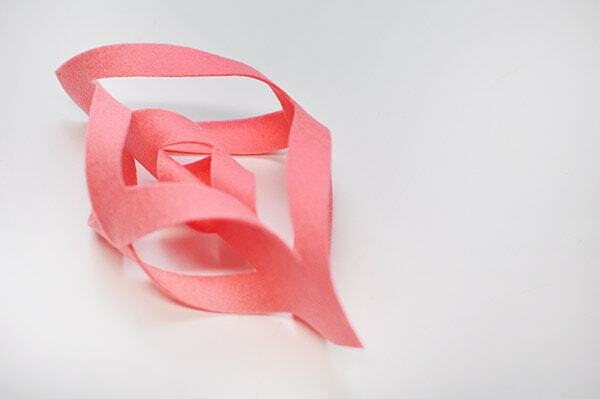 Cut three straight lines in your felt, starting at the bended side of the triangle. Do not cut all the way to the end. 4. Unfold your felt and lay out on a table. 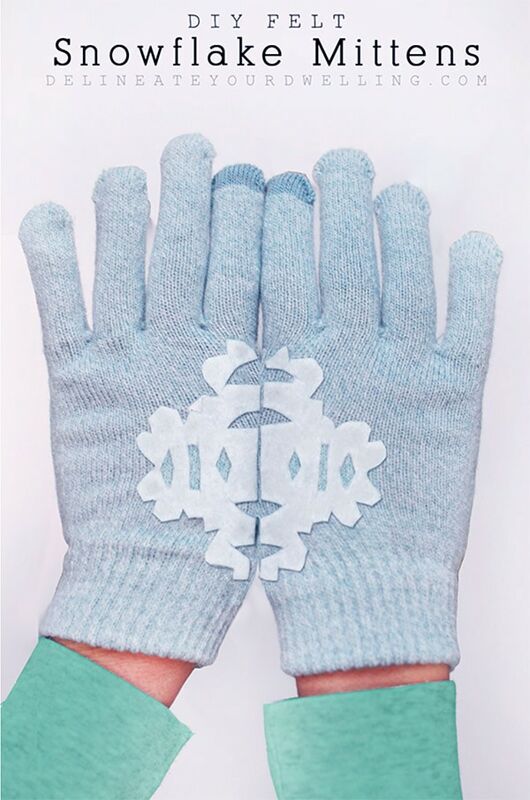 Grab the center corner pieces and using your hot glue gun, adhere the center corner edges together. 5. Turn your felt over so the loop you just glued is now facing down. Now, grab the second set of corner pieces and glue the corner edges together. 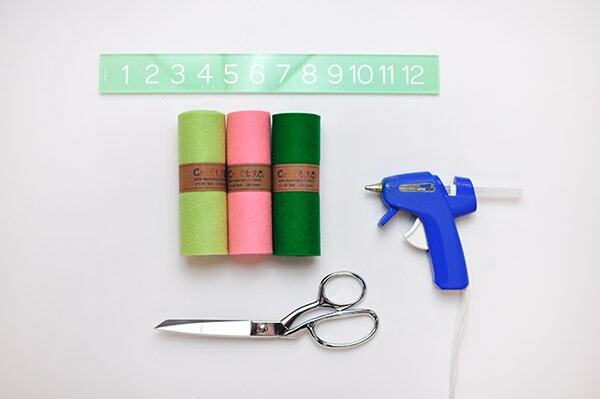 Turn the felt over again and repeat this process until all the corners are glued together. 6. For the green set, I followed the exact same steps but stacked the emerald and mint greens on each other. This creates the dual color look. 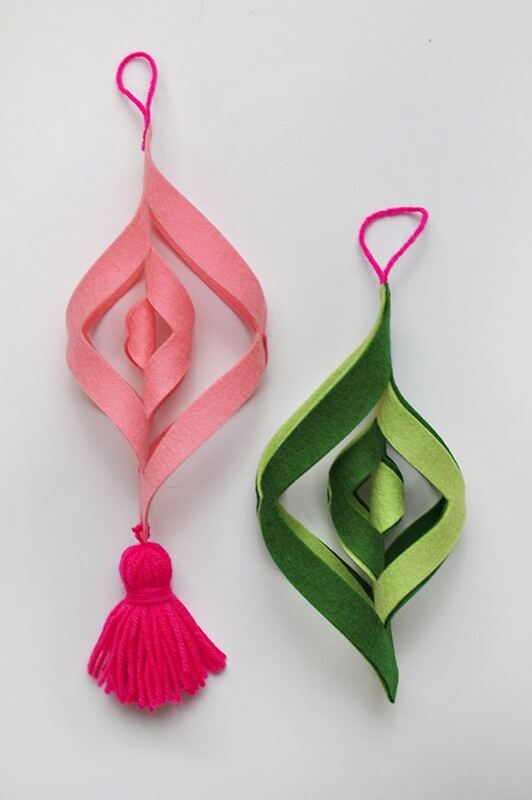 Once the felt ornaments were completed, I added a simple neon pink loop to hang. And then also the pink ornament recieved a lovely pink tassel. I’m not kidding when I say that I may make a LOT more of these… they take no time at all and I love how they spin and create shapes when on the tree! How cute! 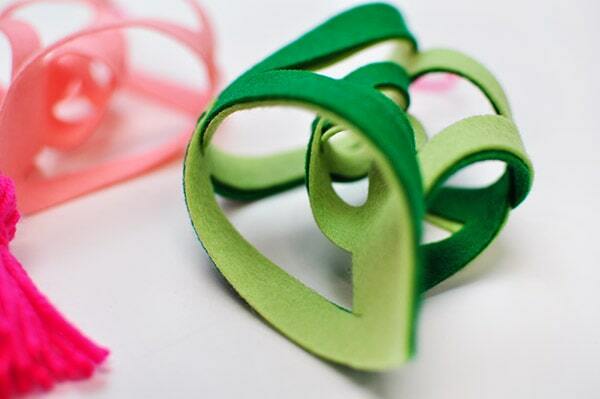 I’ve made something similar from paper, but I always have tons of felt in my craft stash. I think my tree needs some of these! So cute and fun. Oh yes, it does! I can see all kinds of pink, white and black ones on your tree already! These are so cool! They look like a lot of fun to make. And I love the colors you’ve used – so pretty! Thank you Rachel! They were SO fun to make. 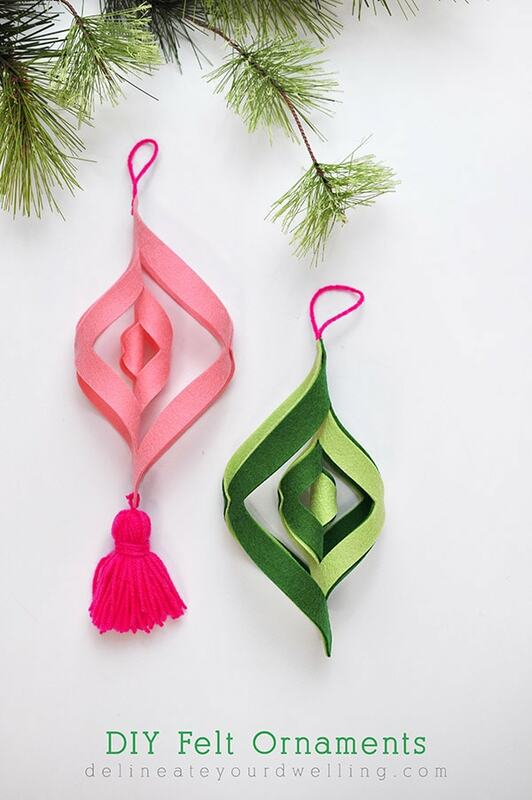 these felt ornaments are so neat! love the two color design! 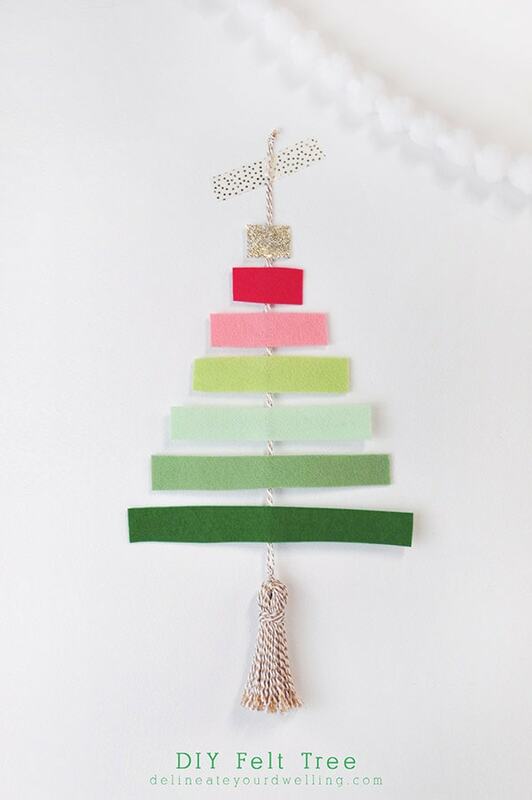 Makes decorating your tree a snap – just choose the colors that match your theme! These are so pretty Amy!! What a beautiful little touch they would add to your tree or anywhere, really! Hurray for felt week! Can’t wait to see what else you’ve got cooking. These are sooo pretty! Okay I’m convinced. I need wool felt in my life! These are super adorable Amy! You definitely need some. I want all the colors, now! Those are really cute, Amy! 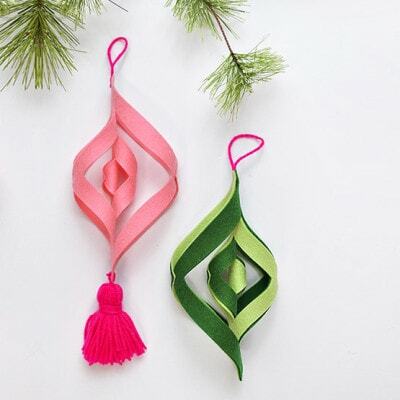 My daughter would love adding these to her sweet little tree! These would be a perfect adult supervised kid activity! SUPER cool! I think we’re going to have to make some, great tutorial! Thanks, I really want to try and make a garland with them now!! I love the shape of these! So cute. I love these! I always forget about felt, but man you can make some great stuff with it! Thanks, Cyd! 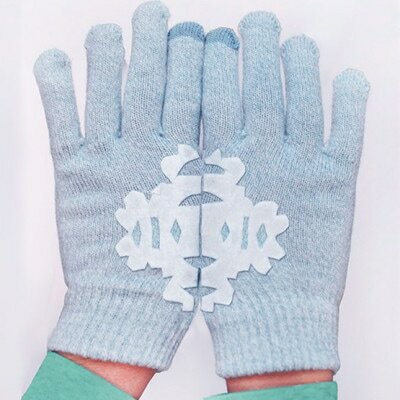 I know, I always forget about felt… but I just found a great source, so I’ve got a week of felt DIY’s now! Hope you are having a fantastic December! Steal away (with credit, hee hee) because I’m so in love I want to make them in every color! And I bet using paper would only be THAT MUCH easier!! Can’t wait to see them, Gwen.